Aquarium at the Boardwalk in Branson, MO is being designed to focus on fun, as you take a walking journey through the oceans of the world. Here, you’ll be mesmerized by up-close views of amazing creatures, ranging from colorful fish, seahorses, and jellyfish to octopi, eels, and sharks. Just imagine doing lots of laughing, and maybe even squealing, as you reach into the water to touch rays and sharks. Plus, along the way, there are plans for you to enjoy all kinds of entertaining activities, such as taking a photo wearing a high-tech diving suit, popping up inside a fish bowl, and sliding through a real tank! Step right up for aquatic fun that you won’t find anywhere else. Have your photo taken with a larger-than-life Giant Pacific Octopus on the Boardwalk, and see a real one too! There’s loads of excitement and games to play along the way to the Submarine Voyage that will take you under the sea to visit the majestic life below the surface. Surround yourself with the sea as you walk through a tunnel right in the heart of the Aquarium and into a sunken ancient city. You’ll be thrilled with sightings of a variety of sharks, a graceful sea turtle, and all kinds of uniquely-striped and patterned fish as they swim circles all around you. Celebrate the boundless beauty of the moon jelly in the most unique way… in the Branson Aquarium’s Jelly Fish Infinity Room. These bioluminescent beings are amazing to watch and even more incredible when you experience them glowing all around you in a color-changing environment that you control! 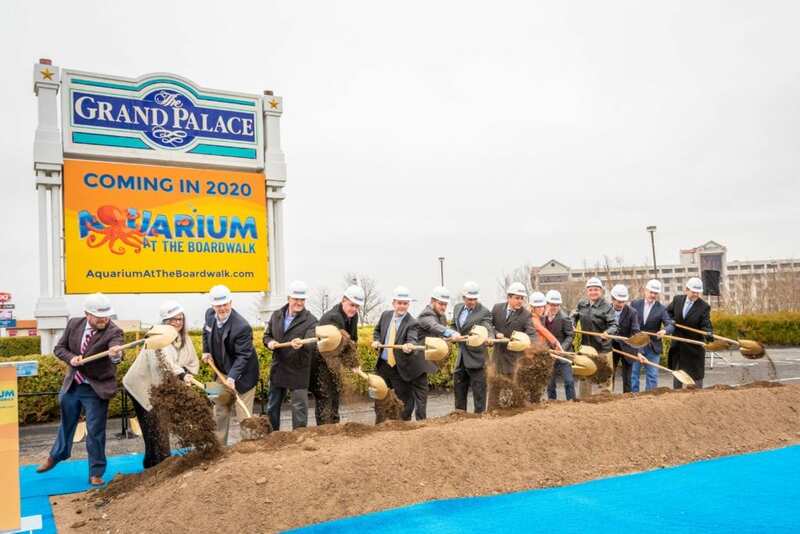 How Excited Are You About Aquarium At The Boardwalk Coming to Branson in 2020? Be the first to know what’s happening with Aquarium at the Boardwalk. Discover a magical underwater Palace where heroic Mermaids safeguard the sea, and you can become an honorary member! Their lovely fortress has been designed for you to enjoy tales of the deep with a real live mermaid. Plus, take in the mesmerizing sight of schooling fish, seahorses, and butterfly fish. KEEP UP-TO-DATE ON EVERYTHING HAPPENING AT AQUARIUM AT THE BOARDWALK RIGHT HERE! Look above your head and across the horizon to appreciate the gliding, diving beauty of stingrays in your own undersea observation station. Delight in an amazing photo op where your youngster pops up in the tank, getting delightfully close to bottom-dwelling Blue Dot stingrays and “winged” Sea Robins. Now’s your chance to dip your fingers into the cool water and feel the bumpy lumpy Horseshoe Crabs, sandpapery Cownose Rays, and smooth from head-to-tail but course from tail-to-head Bamboo Sharks. You’ll be charmed by this opportunity to make new fish friends and get to know about their habits and habitats. Please let us know what information or artwork you’re requesting. Thanks! Scale a replica of the ocean’s giant jellyfish – a sea nettle! You’ll hear lots of happy squeals and laughter as you watch youngsters enjoy their self-directed adventures inside a 14-foot, net-enclosed climber. Keep your camera ready in case yours decides to whoosh down the slide through a swarm of spiny Lionfish! Get a vast view of a gorgeous coral reef, teeming with tropical marine life. At this Branson Aquarium, you’ll marvel at the array of Angelfish, Batfish, Tangs, and many other species in their brilliant colors… and catch a final glimpse of the sharks and rays that come gliding through.